State Board/Commission/Council: Minnesota Governor's Citizens Council on Aging (Chair); 19?? to 19?? Special Legislative Concerns: health and corrections, consumer, senior citizens, governmental reform. He was a member of the Washington County Historical Society. 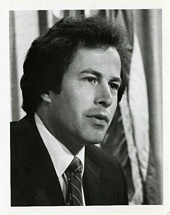 He was an unsuccessful candidate for reelection to the United States House of Representatives in the 1992 election. Sikorski, Gerald Edward. Biographical Directory of the United States Congress.